So here I am again. 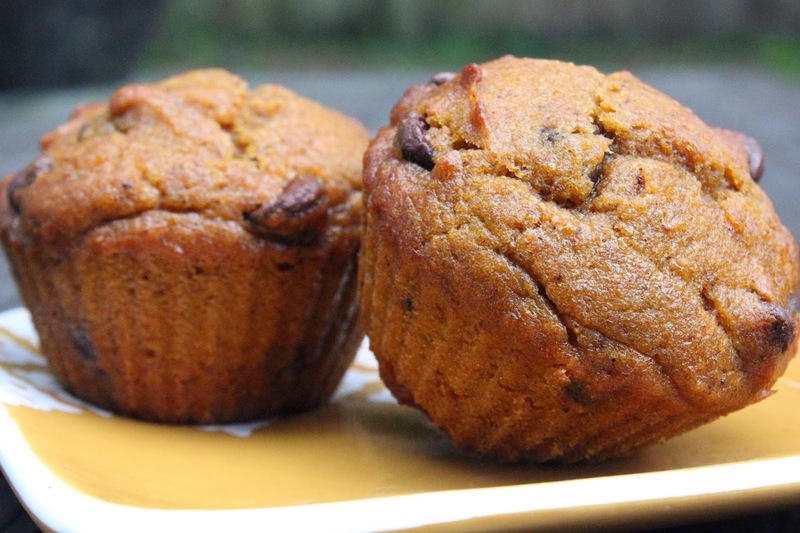 Back on the blog, because these pumpkin muffins deserve serious attention. 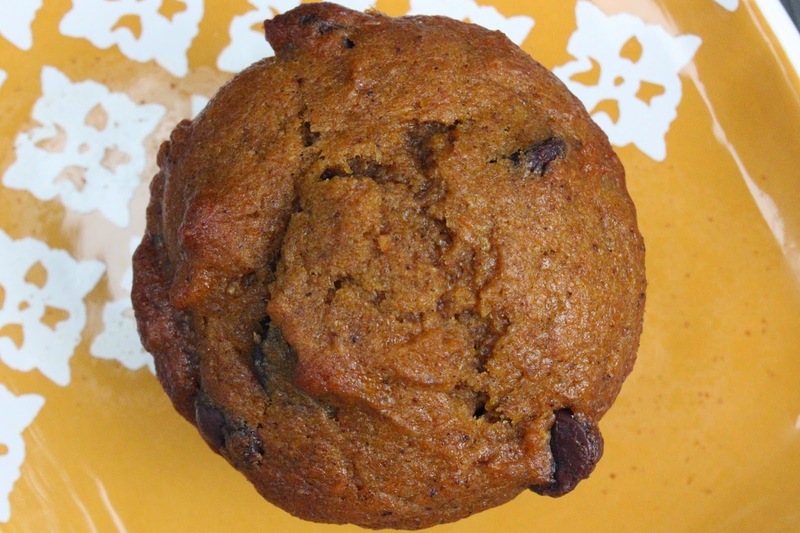 These are the best pumpkin muffins I’ve ever made. 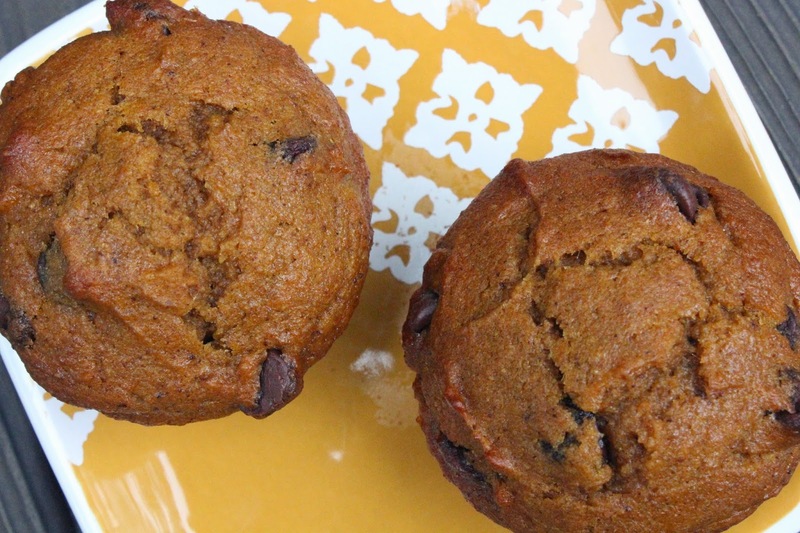 These might even be the best muffins of any kind I’ve ever made. SO SOFT AND SO MOIST. So perfectly pumpkin-y, you can’t deny fall isn’t the best season ever. Then just add some chocolate chips, because chocolate makes everything better. 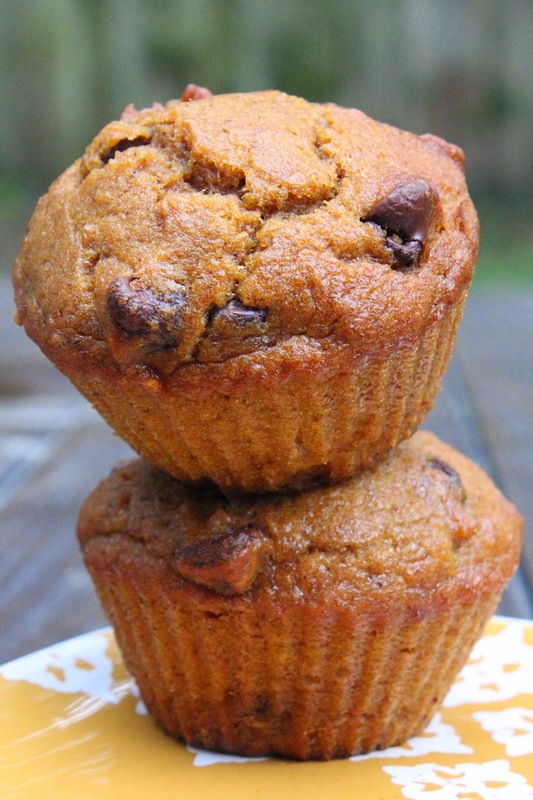 I know I already have a Pumpkin Chocolate Chip Muffin recipe on this blog somewhere, but this is new and improved. I got really into fall spirit by re-decorating a little this weekend too. If you can even call it that. My idea of “decorating” is buying a couple of sparkly fake pumpkins and a seasonal candle from Hobby Lobby and setting them on my mantle. Good enough! In other news, after semi-consistent beach walks with Zoey this spring/summer, she FINALLY lovessss the beach. We took her for a long stroll yesterday, off the leash and all, and she did so well. I’m such a proud puppy-mama. She still isn’t crazy about the water, but is showing more curiosity each time and will at least walk a few inches in to splash around for a minute or two. …in case you cared to know. But, FALL! What festive seasonal treats and eats have you made so far? I get into pumpkin for a couple weeks, but then it’s time to move on (until Thanksgiving comes around when I NEED pumpkin pie). Spaghetti squash and chili are calling my name. I’m dying for some apple cider doughnuts too, which I’ve seen on blog after blog, instagram pic after instagram pic. I’d rather just go buy one than even attempt to make those on my own. Where can I get a good one in Charleston?! Someone please tell me. Thanks. 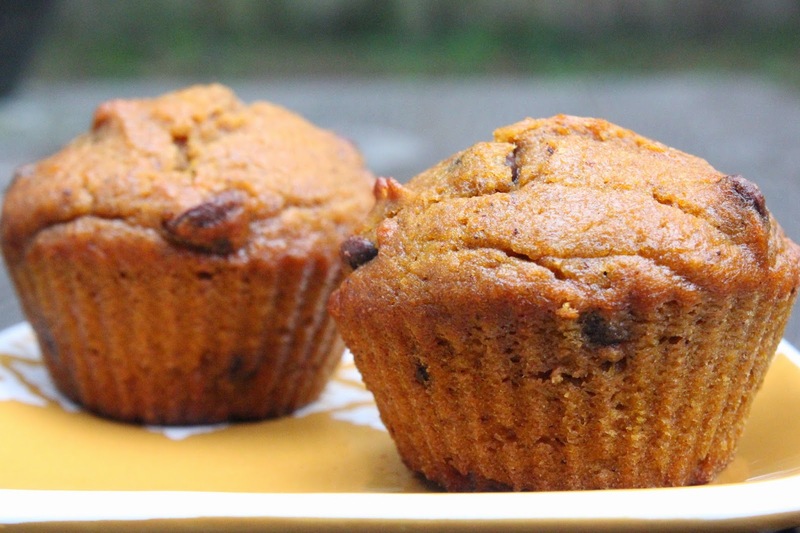 Then go make some of these muffins. You won’t regret it. 1. Preheat oven to 350 degrees. Fill muffin tin with liners and set aside. 2. In a large bowl, combine flours, salt, baking powder, baking soda, cinnamon, nutmeg, cloves and sugars. 3. In a separate bowl, whisk together the eggs, oil and pumpkin puree. Add wet ingredients to dry ingredients and stir to combine. Add chocolate chips and gently stir until evenly distributed. 4. Pour batter into muffin cups, about 3/4 full. 5. 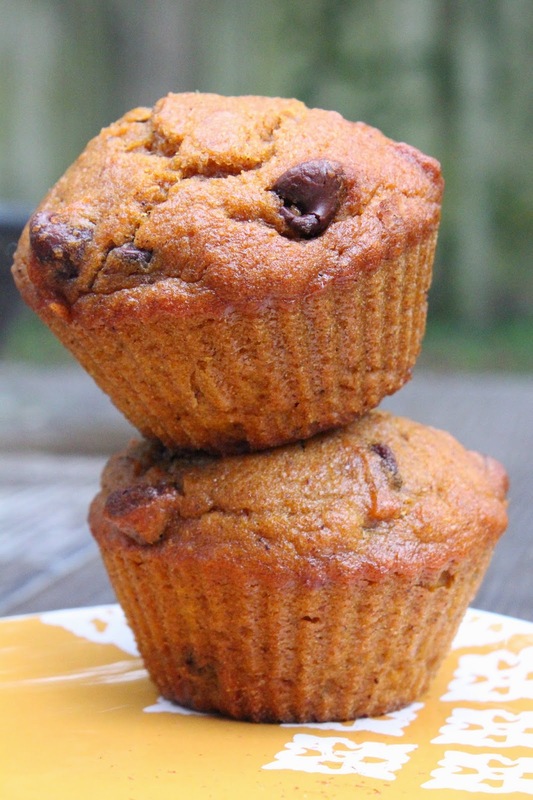 Bake 26-28 minutes or until toothpick inserted in the middle of a muffin comes out clean. Remove from oven and let cool 10 minutes before removing from pan. Serve warm with butter. *Store extras at room temperature in an airtight container for up to 5 days.